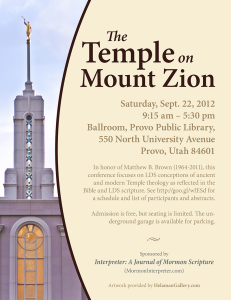 The Interpreter Foundation is sponsoring “The Temple on Mount Zion” Conference coming up later this month on September 22, 2012, and which will take place at the Provo Public Library, in Provo, Utah. To spread the word about this conference, there is a flyer now available to download, print, share, email, and post online. I think this conference will be excellent, and I recommend that you take a moment now to post this flyer wherever you can to help others learn about it. Twitter TempleStudy.com Profile – follow me here on Twitter to get the latest updates from the site in your Twitter stream. Facebook TempleStudy.com Page – become a fan of the TempleStudy.com page on Facebook, and see updates from the site in your Facebook News Feed, and easily share them with friends from there. Now you don’t need to be updated about my frequent 5K runs anymore, if you don’t want to (I’m training for a half marathon in June). But if you are interested in my personal activities, you might like to know that I just finished version 1.0 of BryceHaymond.com, my design consultancy business I call Blackpool Design. As I mentioned a couple weeks ago, I’m out of full-time work, and I’m looking for clients who need freelance design, whether product design, graphic design, or web design. If you know of someone who is looking for design, I’d be very grateful for your referral. Once I get my house in order a bit more, I’d really like to get back to studying the temple, and sharing with you what I learn. This is truly an inexhaustible subject. My brother and I are pleased to announce the launch of our latest project—the FollowTheProphet.net website! This new website has been in design and development for the past month, and we are happy to finally be able to announce today that it is available. FollowTheProphet.net is a website that allows members of the Church to follow the living prophet more closely. We go from General Conference to General Conference often not hearing or knowing what the prophet is doing, saying, or teaching. Not long ago, the activities of the prophet were much more well known among the membership of the Church. The prophet and members lived very close geographically, and members could even meet personally with the prophet. Today, with over 13 million members scattered worldwide, the activities of the prophet are much lesser known. Members who don’t live in Utah may only know what the prophet is doing every six months at General Conference. FollowTheProphet.net helps to fill that gap of knowledge. With advances in search technology, we are able to aggregate all public information we find about where the prophet is, what he is doing, saying, teaching, visiting, etc., and post it all in one central place at FollowTheProphet.net. Any talks or speeches he gives, we will post links to his words. Any trips he goes on, we will post information about his visits. Any temples he dedicates, we will inform you about the events. Hopefully this will help you feel a closer connection with God’s living prophet, and stay up-to-date about his activities and his counsel. We believe that in these turbulent times, we will be safe if we stay close to the living prophet of God and heed his word. More information about the new website can be found on the About page at FollowTheProphet.net, such as the ability to “follow the prophet” via Twitter, RSS, email, or Facebook. We are excited to bring you this new service, and hope you will enjoy it! Please give us any tips, suggestions, or feedback that you may have that would help us improve the site.